A new plus-sized classic denim skirt with apple and pear plevis options! 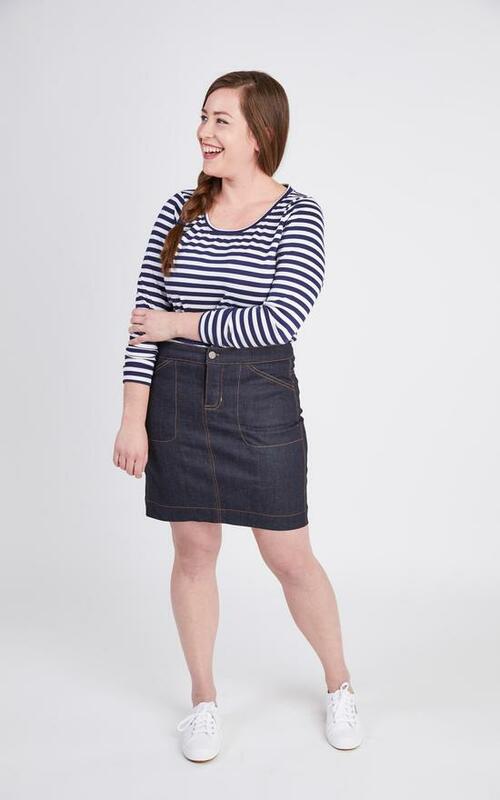 Classic denim has got an update with the Ellis Skirt! Designed for stretch wovens, this skirt pattern promises a flawless fit with two pelvis options (apple or pear), as well as a shaped yoke, fitted waistband, and tailored back darts. View A is an iconic jean skirt, featuring a knee-length hem, front slit, rivets, belt loops, and rounded 5-pocket design, while View B is a flirty mini-skirt with clever diagonal pockets and topstitching detail. Designed for intermediate sewers, the sewing pattern has a good range of sizes from 12 to 28, with apple and pear fit options. The sewing pattern can be used with mid- to heavy-weight stretch woven fabrics such as denim (10-12 oz), corduroy or canvas, with at least 15% stretch across the grain. Lining fabrics suitable include non-stretch cotton.